rays [and hence, the overall level of solar activity] is the solar modulation potential , which can be derived from either the 10Be or the 14C production rates." "....spectral analysis [of the solar modulation potential over the last ~ 9400 years] identifies a number of distinct periodicities (Stuiver & Braziunas 1993), such as 88 yr (Gleissberg), 104 yr, 150 yr, 208 yr (de Vries), 506 yr, 1000 yr (Eddy), and 2200 yr (Hallstatt) [cycles]..."
The top figure in the following diagram shows the Fourier transform of the variation in the solar modulation potential time series over the last 9400 years [Abreu et al. 2012]. This figure shows that potential has distinct spectral peaks at 88 years (Gleissberg Cycle), 104 years, 133 years, 150 years, 210 years (de Vries Cycle), 232 years, 356 years and 504 years. 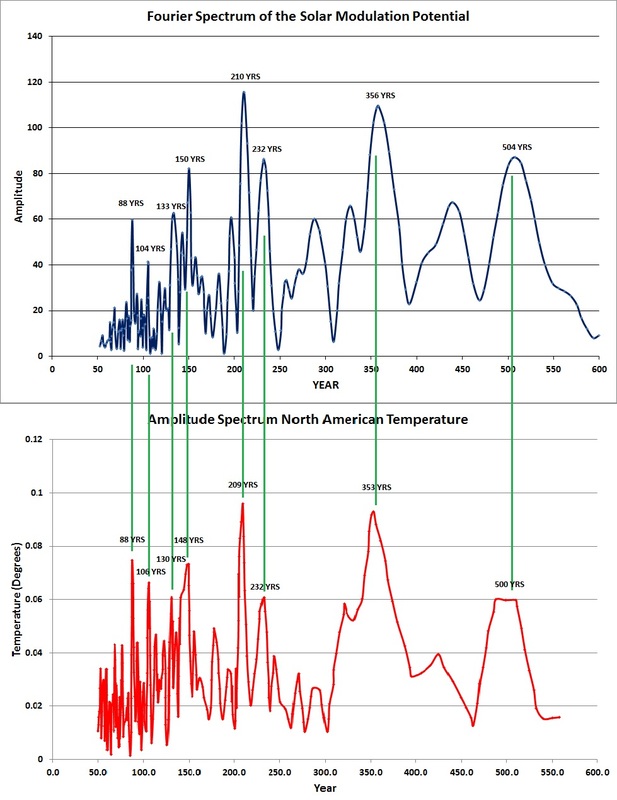 Below this is a second figure showing amplitude spectrum of variations in the North American temperature time series over the last ~ 7000 years. 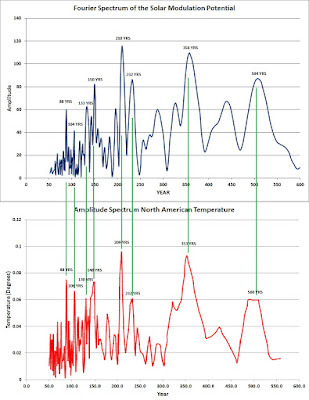 The temperature time series is obtained from tree ring data obtained from Bristle Cones on the Southern Colorado Plateau [for the details of the source of this data see: Could This Be The Climate Smoking Gun? and Salzer and Kipfmeuller (2005). The lower figure shows clear spectral peaks at approximately 88, 106, 130, 148, 209, 232, 353 and 500 years. This seems to be very strong evidence that Sun has always had an important influence upon climate conditions [such as temperature] at a regional level. Why are some many people ignoring this obvious climate connection? Note: The top figure was recreated from a digitization of figure 5a of Abreu et al. while the bottom figure was recreated from digitization of part of figure 3a of Ron et al. .
1. Is there a planetary influence on solar activity? J. A. Abreu, J. Beer, A. Ferriz-Mas; K. G. McCracken, and F. Steinhilber. 2. Solar Excitation of Bicentennial Earth Rotation Oscillations. 3. Reconstructed temperature and precipitation on a millennial timescale from tree-rings in the Southern Colorado Plateau.